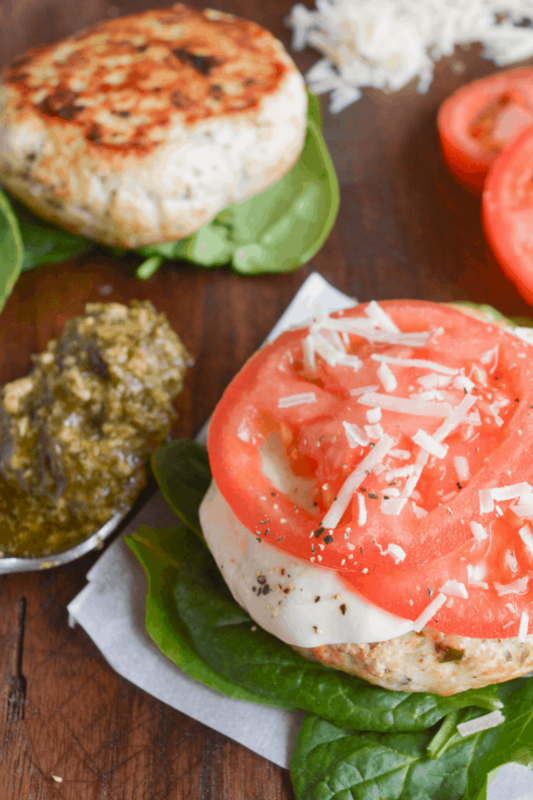 These Keto Chicken Pesto Burgers are a fresh treat full of protein and flavor! 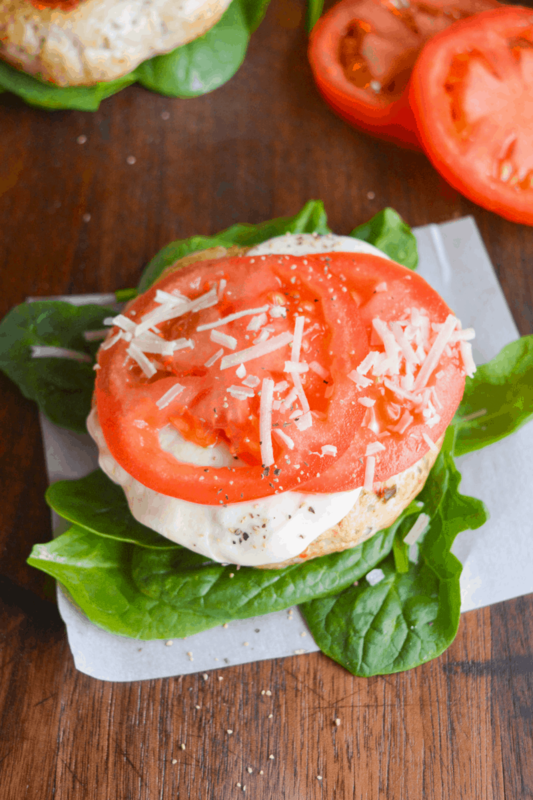 You can eat it on a bed of spinach, or add a low carb bun for a more traditional sandwich. Ground chicken is an ingredient I love to use. 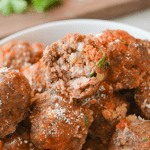 It’s easy to work with, flavorful, and sometimes fatty (if you use ground chicken thigh). One of my first recipes, for chicken crust pizza, used ground chicken as its base and I’ve been hooked ever since! 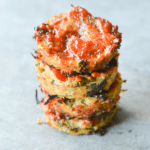 We all know chicken goes great with pesto, like in my low carb chicken pesto bake, but have you ever considered a pesto burger? By the end of this post, you’ll be ready to cook some up for your next meal! These burgers incorporate the delicious pesto flavor directly into the chicken base. 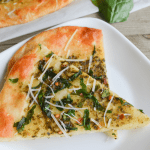 It evenly distributes the flavor and keeps you from having the oily mess that can often be associated with pesto. There’s fresh and amazing flavor all over this beauty! I didn’t feel like it needed much extra seasoning because the pesto was so delectable. For this recipe I chose to use chicken breast. 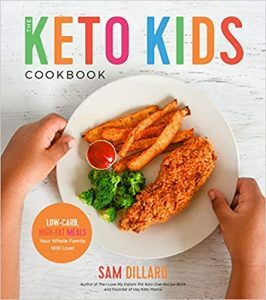 Chicken breast is lower in fat than chicken thigh, but that doesn’t mean you have to avoid it while following a ketogenic diet. Sometimes a lighter meal is just what you need. 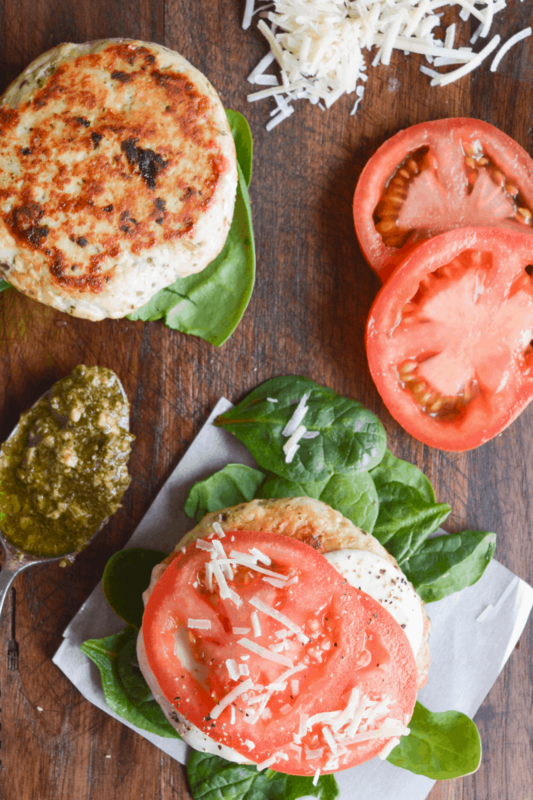 This Pesto Chicken Burger is higher in protein than fat, and that’s okay. Because ketosis is achieved by carb restriction, not the amount of fat you consume. Fat is important on your keto diet, but every meal doesn’t have to be 5% carbs, 20% protein, and 75% fat in order for you to be doing it right. 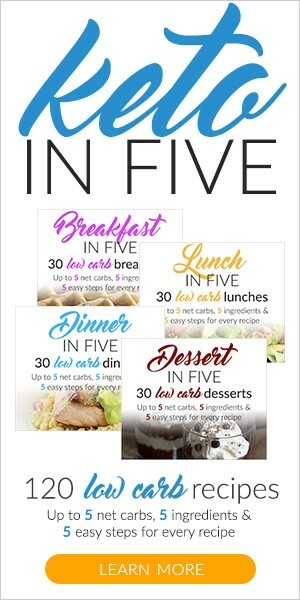 It just means that you can substitute in ground chicken thigh, add a fatty side dish like a salad with ranch, or enjoy a higher fat treat later…whatever works for you and your individual macronutrient goals. 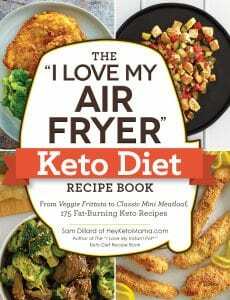 Personally, I like the flexibility of keto. Not every meal has to be high fat as long as you focus on your protein macros (to keep from losing muscle) and use your fat macro goal as needed. It’s shockingly simple, and also kind of elegant if you’re making it for company! And here’s a breakdown of nutrition based on the ingredients that I used. In a large bowl, mix the ground chicken, pesto, and Parmesan. Sprinkle with salt and pepper, to taste. Separate the meat into 4 sections and form into patties. Ground chicken is a little more wet than ground beef, but should still handle easily. If you find it's too sticky when forming patties, wet your hands with a little water. It will make prevent sticking and make them easier to smooth out. In a skillet over medium heat, drizzle the olive oil. Once the pan is hot, add the patties to the skillet, working in two batches as needed. Don't overcrowd the pan because then it will cause the burgers to steam and not get a crispy sear. Cook the burgers for 7-10 minutes, flipping half way to get a golden sear on each side. Reduce the heat slightly and continue cooking for 5-10 more minutes or until the internal temperature reaches at least 165 degrees Fahrenheit. If you overcook them too much, they may get dry. Feel free to add a tablespoon of water to the pan and cover it if your burgers are on the thicker side and having trouble finishing up. Let the burgers rest for at least 5 minutes. To serve, place a slice of fresh mozzarella on each and top with tomato slices. Sprinkle with black pepper and a pinch of salt, if desired. Enjoy wrapped in lettuce, on a bed of spinach, or even just on the plate. For this recipe, I used chicken breast because it best fits the flavor I was trying to achieve. Feel free to sub with ground chicken thigh for higher fat and adjust your personal nutrition. Chicken breast is lower in fat than chicken thigh but still perfectly okay to use for high fat diets since you're adding fat in other ways such as oils and cheese or side dishes such as a side salad with ranch.